Electro pop keytar accents INTI's solid hip hop beats & dance rock basslines. Captivating visuals and satirical skits use wit as a weapon for social commentary. From a dancer in a gas mask to a patriotic doctor pushing meds, INTI uses bright colorful costuming and sensational visuals to poke fun at politics, the media, the music industry, the counter culture, the mainstream and themselves. Originating in Texas, INTI wrote 2008 debut album “RADIO REVOLUCION” while traveling across Central America. Music video for INTI anthem “Almas sin Armas” shot on Aztec pyramids outside of Mexico City and in the Mayan villages of Guatemala reflects the cultural journey of Latinos born in “el otro lado” the United States. INTI’s defiant lyrics mix Spanish and English speaking to both sides of the border. 2009 Album "Chemtrail Candy" tackles the irony of music as merchandise and art as a commodity with the band chanting "you know you want it" while pushing their “candy" a self-proclaimed antidote to protect from the negative effects of those mysterious vapor trails in the sky known as chemtrails. Urban roots, world travels, art as a form of social activism and music as a means to keep people dancing define INTI's distinct analog post-modern rock. The name refers to the South American sun god INTI, often depicted as a great warrior, as well as the pre-Columbian Mexica legend regarding Los Hijos del Quinto Sol, the Children of the 5th Sun. "Inti blew everyone into blissed out space with their new album material that is over the top. A whole new style of music, TRIBAL PUNK, edgy and danceable yet smooth." 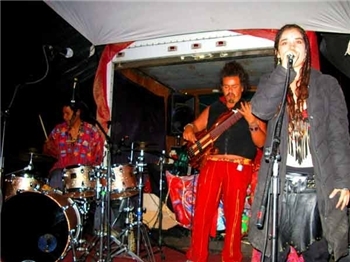 After 7 years of extensive touring as part of the legendary tribal rock group Kan'Nal, the INTI band moved their studio into the 5 Points District of downtown Denver, Colorado to write and produce 2009 release "CHEMTRAIL CANDY." The album passionately delivers INTI's authentic fusion of urban and ethnic, hip hop and punk. Mind bending title track remix features legendary violinist Steven Kindler of Mahavishnu Orchestra. Uplifting lyrics call for the empowered activation of an educated populace fiercely protecting basic human rights. Drummer and music producer Gilly Gonzalez, bassist Rodolfo Escobar and vocalist Teresita Hinojosa began their musical journey together in the San Antonio underground warehouse art scene during the experimental noise rock days of the late '90s. The power trio released 3 albums each under a different name ultimately defining INTI's core persona. By 2001, five of INTI's six members had joined epic tribal rock band Kan'Nal. Gilly, Rodo, Teresita, dancer/visual designer Akayate and audio engineer Mateo dedicated seven years to extensive touring throughout Northern and Central America with two full length commercial releases and a Sony Red distribution contract. In 2009, Kan'nal disbanded leaving the INTI core to unearth their roots at their 5 Point studio amidst the culturally vibrant inner city landscape of Denver, CO. A dynamic front duo element emerged when INTI joined forces with versatile vocalist Precious Hill (Katsuk, AAA) to write and record 2 studio albums. With 3rd album “Live Amongst Ghosts” on the way, INTI continuously pushes the boundaries of convention. 2009 release "Chemtrail Candy" recorded at state of the art Immersive Studios in Boulder, CO explodes with INTI's energetic urgency and integrity. The album features legendary violinist Steven Kindler (Mahavishnu Orchestra, Jeff Beck) who brings ripping melodies to title track remix and several new songs. Special guest Jesse Cotton Stone (Black Hole Mystery School) powers up the toughest songs of “Chemtrail Candy” with electrifying guitars. The album highlights INTI's cultural and musical influences ranging from reggae, latin hip hop, dub and world to electro punk dance rock. “Chemtrail Candy” crosses borders and barriers to activate individuals worldwide. "Inti, bravissimi, grandi, bella musica! Grazie per la richiesta! Ciao apresto!" "Yes, bring it on and turn it up guys." 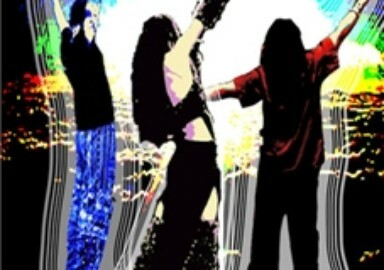 INTI plays all original music for a 60 - 120 minute set. Almas sin Armas "Radio Revolucion"
quien se los puede quitar?! La Revolucion Pacifica! La Revolucion Pacifica! it's a brand new day. all the children can come out to play. see the sun with us every day. what the future holds… seize the day, seize the hour! we think we know, open blown… at last! My spirit so strong, now I know I am ready… at last! sugar run, tell me do ya want some? your eyes closed to the truth around you? back turned to the world around? imposed on our souls, what prison camp of prisms? a holographic image enlarged just to live in, YEAH! we got the anit-dote, do ya want one? LET IT GO "Chemtrail Candy"
and if you shoot those daggers, you're gonna get hit! know? are you ready to let go? Tribal people defending mass territory! Who’s got the power? You you got the power! Who’s got the power? You you got it! You got it! You you got it! by the curious mind spirit in the temple can you hear it?